Sunday 27th August saw me returning to the town of my birth, more than 55 years after my family had left Ayr for Stewarton. Of course, I’ve been back a few times since then and I’ve participated in a few races in the old town too. 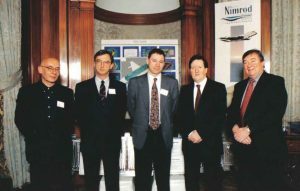 I’ve also got a special interest in the aerospace industry, having worked in the industry for over 13 years, I also did my Master’s Thesis on the need for a Scottish Aerospace Consortium? and have published a number of reports on the industry, including The Aerospace Industry: A Case for European Integration? ; and The Aerospace Industry in Scotland: The Need for an Industrial Strategy: a Report on the Aerospace Industry in Scotland. 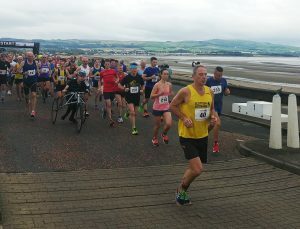 More recently, I was the Manager for the Aerospace Sector at Skills Development Scotland and worked with Ayr College; UWS Ayr Campus, local aerospace companies, trade unions and politicians to support the sector in the locality, so I couldn’t miss the opportunity to run in the inaugural Airshow Ayr 10k race. The race started and finished along the town’s esplanade but unlike the local Turkey Trot races, which use the Citadel as the race HQ, the organisers used the Mercure Hotel as their HQ which made logistics a little more difficult, with runners having to factor in a visit to the hotel and car parking to their race day plans. Whilst some car parks are free, others are not and the thought of having to pay parking costs on top of a heavy £27 race fee may have proved too much for potential runners with less than 260 participating in the 10k race. 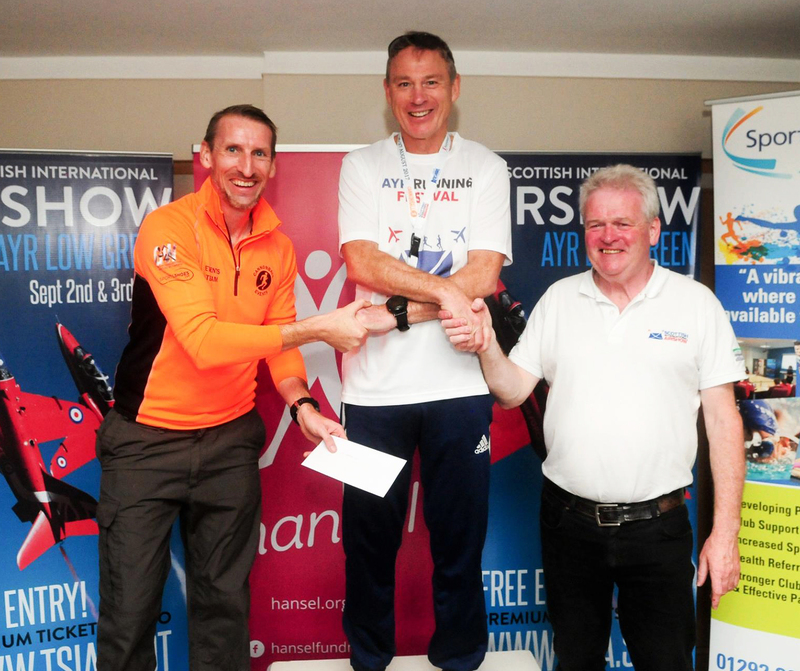 That said, the organisers were offering a plethora of prizes for individual runners and teams too, including £15 cash for the 1st Male Veteran 60+. 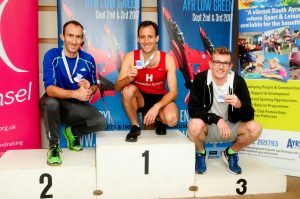 I had won that particular age category race at Kilmarnock in June and I was hoping for an Ayrshire double here in Kyle. the wind on our backs before turning right, past the 1k marker and behind the Citadel, another right took us along the River Ayr and the third one took us uphill onto Fort Street, past the local academy and into the headwind. We reached the roundabout and the road became Alloway Place. With almost 2k under our belts, the race was beginning to open up and although it would have been good to be running in a group, I found myself running alone. We continued along the A719 for another kilometre before a sharp right took us down Blackburn Road and back towards the coast. At the bottom of the road, we turned left onto Blackburn Drive, which runs parallel to the esplanade. With the only houses/shelter being on our left-hand side, we felt the full force of the head wind along this section. Early doors with Jean-Yves and Marianne in front of me before the pack split up and left me running alone. 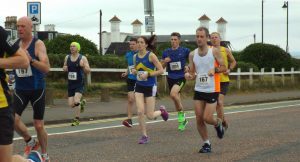 I was finding it hard work but I kept my focus on the tall figure of Jean-Yves Daniel and the distinctive Calderglen vest of Joanne McEvoy who were both already well in front of me. The road became Seafield Drive and the field continued to open out. A sharp left turn took us on to the lovely named Auchendoon Crescent and another on to the sheltered Arrol Drive. I had hoped that I would have been able to increase the pace a bit when out of the wind and I did, but only marginal. We ran across Seafield Road and onto Westfield Road at about the 5k point. I didn’t realise it at the time but I had just run my fastest 5k (20:10) since November 2016, all that I knew was that I was working damn hard and I still had another 5k to go. I ignored the water station and didn’t get distracted by the slower runners that we met when we returned to Blackburn Road. This time we turned to our right and then took another right, back onto the A719. I knew that the second half of the race would be less twisty but it didn’t make it any easier. It was a long lonely mile, slightly uphill and into the wind. Jean-Yves and Joanne were barely in sight and there were only a handful of runners between them and me. 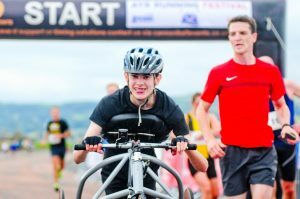 I was joined briefly, by another local lad, 16-year-old, multi-world record holder Gavin Drysdale of Red Star, my attempt to stick with him and his guide were in vain and he made a mockery of his cerebral palsy as he wheeled away into the distance. I had missed the 6k marker if there was one, so I was relieved to reach the 7k one. Not surprisingly, the 7th kilometre had been my slowest at 4:29. “Only 3k to go”, I thought to myself. I knew the course from here as we were back on the Turkey Trot 10k route. I tried to pick up the pace on Doonfoot Road and then turned right along the narrow river side path. It was quite congested here with locals out for their morning walk and it was more undulating than I remembered. To cap it all, I felt a sharp pain on my left side just below the rib cage as a stitch kicked in. I was now in real pain but surprised myself by overtaking a runner before reaching the seafront and the 8k point. The 8th k had taken 4:22.
but there wasn’t one in sight. Instead, I was to see it painted on the path as my Garmin beeped. Somehow I managed to complete the penultimate kilometre in 4:13. I had convinced myself that the last kilometre would take care of itself but boy did I have to work hard, both physically and mentally along the esplanade to the finish line. It was with gritted teeth that I ran down the final strait as I agonisingly watched the race clock tick over 42:59. The final kilometre had taken 4:14 of pure hell. I couldn’t have given anymore but I was still disappointed not to get a sub 43min time. 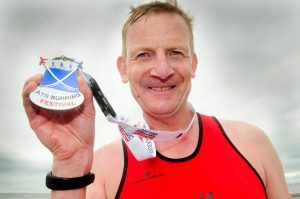 I completed the race in a chip time of 43:08, which is eighty-two seconds faster than my previous 10k, at Kilmarnock in June, and my best 10k in over two years. Once I had composed myself and collected my goody bag, I checked my time and position on one of the terminals provided and discovered that I had indeed won the MV60 race, which helped to ease the pain a little. I later discovered that my time was the 200th fastest 10k run by a V60 in the UK this year. There was a bit of a wait until noon for the prize giving ceremony, which we discovered was being held at the race HQ. It was good to see my running buddies doing so well in the women’s event. 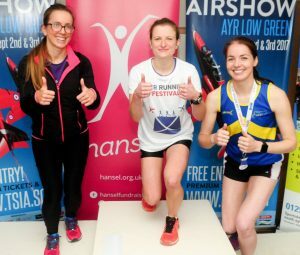 Jessica Martin of Shettleston Harriers won the women’s race in 38:54, with Calderglen’s Joanne McEvoy placing second in 42:05 and local lass Marianne Wilson, representing North Highland Harriers, third in 44:07. In the men’s race, the winners came from further afield with Philip Cooper of Hallamshire Harriers, Sheffield winning in 34:10, more than one minute ahead of Robin Muir of Cheshire’s Spectrum Striders (35:12) with Aberdeen AAC’s Euan Webster a further fifty seconds behind, earning bronze with a time of 35:22. 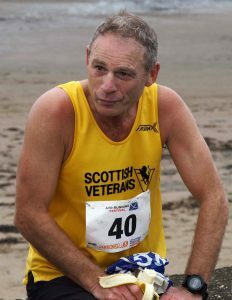 Congratulations to them all and a special mention to Irvine AC’s Jim Sneddon who completed his 150th 10k race on the day. Not too bad a way to end the day. On that note, many thanks to the Airshow’s official photographer, Alexandra Hayden, Kenny Philips and Marianne’s dad, Tom Wilson for allowing me to use their photographs. 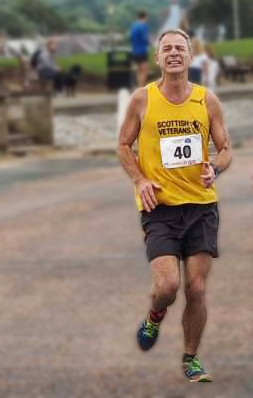 Congratulations to Irvine Running Club’s Jim Sneddon who marked the occasion by registering his 150th 10k Race, which is sixty more than me. Well done Jim.